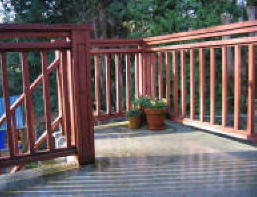 Deck Design Upgrades is a site all about affordable deck enhancements. It's published by Peter and Leanne Tremblay in the midst of updating their own deck. Through our own deck upgrade project, we’ve found that you can update the style of your deck with railings and post caps to match the style of the home, and add low voltage deck lighting for nighttime entertaining. With a patio heater or outdoor fireplace, you get more mileage out of your deck through the seasons. We've also found that folks who visit this site are also really interested in adding Polynesian touches to their backyards in the form of tiki huts and tiki bars. If you think a thatched roof is impossible in the middle of a Canadian winter, think again! We discovered easy-to-use deck design software from Big Hammer makes it possible to explore different ideas shapes and sizes before committing to a contractor or even landscape designer. As you can see, our own deck project has evolved from a modest second story kitchen deck, to a multilevel deck with the option for a hot tub later if we want.